It's been nine months since we last had a look at clever kitchen sinks, so I did some snooping around and was more than amazed at what you can find-if you have the money and a kitchen decor that supports these models. Even if they're not for you, it's still great to see what's in the marketplace to stimulate your idea factory. 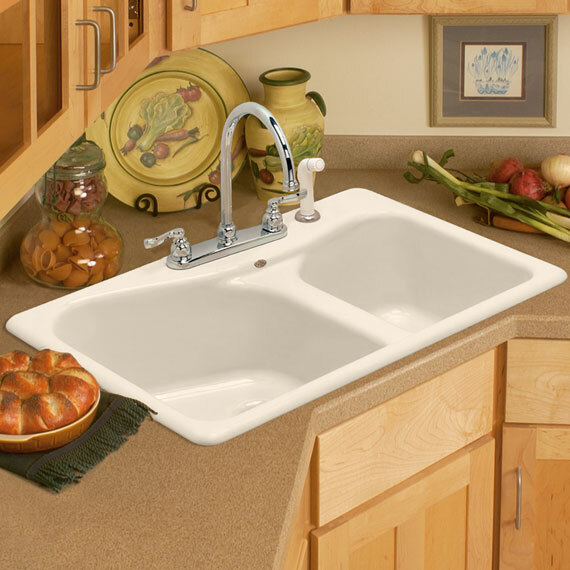 This American Standard Country Kitchen sink can be the perfect fit to complete a warm, country kitchen. Strong and spacious, it makes me think of winter days with biscuits and gravy and coffee brewing. This double-bowl, cast-iron sink (pictured mounted at a corner) offers one sink for your disposal and food preparation, and another for stacking china for cleanup. Under-mounted sinks can really tighten up your entire theme and make countertop cleanup a snap. 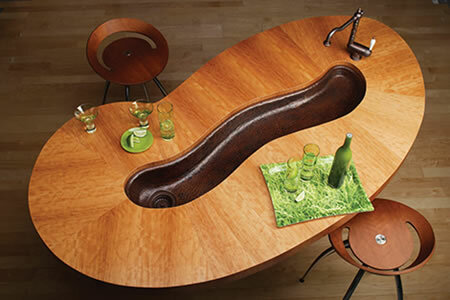 You can even add router grooves in the countertops so they drain water or sauces directly into the sink. This Mystic River sink captured an award from Interior Design Magazine in 2007. The recycled copper makes this choice a green one and when set in a wooden table or countertop, it's a stunning alternative to bland sinks. Its copper patina only deepens over time. Too pricey for me, but imagine how people who normally hover over the stove can move on over to the sink during parties. These days, sink material choices toward acrylic or solid surfaces seem to be the trend. But I'm still a sucker for porcelain over cast iron over stainless steel. Have a look around at home improvement stores and manufacturer shops or websites. You can find everything, including the kitchen sink! This entry was posted on Monday, January 04th, 2010 at 03:01 pm and is filed under Uncategorized , Remodeling , Kitchens , General Remodeling . You can follow any responses to this entry through the RSS 2.0 feed.